Your Dentist Near Bay Shore is Open 7 Days a Week! These days our lives only seem to be getting busier! It’s often hard for our hectic schedules to allow for everything that needs to get done, especially when you have children. Dr. Gary Rosenfeld and his team understand this, and we want our schedule to accommodate yours, and not the other way around, and this is why your dentist near Bay Shore is open 7 days a week! Here are some of the services and amenities you can expect to receive at East Islip Dental Care every day. We welcome patients of all ages to our practice. We know that when families can see the same dental provider it’s not only more convenient for them, it’s also more comfortable! Early dental visits are important for your child, and we’ll make every effort to ensure that they feel safe and at ease. Our goal is that they look forward to coming to their dental appointments. 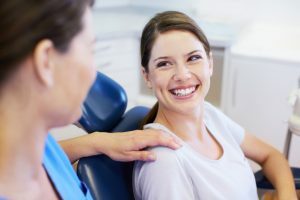 For our adult patients, we offer a full range of services designed to meet their needs here at East Islip Dental Care, so you’ll rarely be referred elsewhere for your care. Whether you need a cleaning, a tooth repaired, or you’d like to make enhancements to your smile, our highly skilled team has got you covered, and we offer morning, evening, and weekend hours that will accommodate any busy schedule. Digital x-rays – These emit 80% less radiation than traditional x-rays and they offer a clearer picture that is readily available for viewing. Intraoral camera – Imagine seeing full color pictures of your teeth and mouth! This is what the intraoral camera can do. Dental lasers – Lasers allows us to perform periodontal therapy and soft tissue procedures that are much more comfortable and efficient for our patients. Digital imaging – Ready to enhance your smile? Digital imaging helps us show you the possibilities for your smile, and exactly what it will look like after your treatment is completed. With convenient appointments readily available for you and your family, you should call East Islip Dental Care today to schedule your next appointment! Comments Off on Your Dentist Near Bay Shore is Open 7 Days a Week!